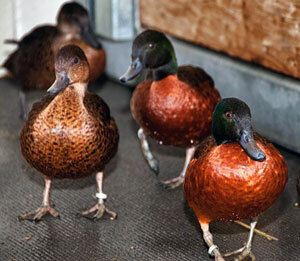 The Milwaukee County Zoo recently acquired two pairs of chestnut teals from the Pinola Preserve in Louisiana. This is a new species for the Zoo. In the wild, these pretty dabbling ducks are found in Australia and Tasmania. They are one of the few duck species that forage for food in both fresh and salt water. The males are distinguished from the females by their iridescent green heads and necks. Since chestnut teals form monogamous, lifetime bonds, the Zoo hopes these pairs will breed in the future. Visit the chestnut teals daily, in the Herb and Nada Mahler Family Aviary’s free flight area. Dabbling ducks find food/forage near the surface as opposed to diving ducks that feed underwater. Dabblers tend to have smaller feet, placed more forward on the body. Divers have larger feet (more useful in propelling them underwater) placed further back on the body.